Automated Risk Assessment Instantly Generates Reports, Provides Detailed Findings and Recommendations. Designed for the Health, Insurance and Financial Industries. Every business needs a strong, effective risk management program. Taking preventative actions to avoid a breach can prevent business interruption and save thousands. SIMBUS RA allows organizations to perform their own risk assessments, quickly and without the high cost, and hassle, of using 3rd parties. SIMBUS RA is a cloud based solution and can be accessed immediately after purchase. Simply checkout, setup your username and password and get instant access to your private dashboard. Most Assessments average 200 questions. Our compliance expert, Rebecca Herold has taken her experience and condensed our SRA to 55 easily understandable questions with nothing left out. SIMBUS RA creates an instant report upon completion. Full graphical and printable view with findings and recommendations plus a score of high medium or low based on each question answered. Once the report is generated each question has its own mitigation section where users can add corrective action plans, describe actions taken, assign tasks and set final completion dates. Each question in SIMBUS references the regulation and standard for HIPAA, NIST and ISO. With a simple click of the mouse, a popup gives users access to the content without ever leaving the page. SIMBUS Multi-Location SRA allows companies to take multiple SRA’s concurrently. Each location comes with custom reports, mitigation tasks, findings and recommendations exclusive to other locations. Hover over items below to see a description. Most Risk Assessments average over 200 questions. Ours is less than 100. Why pay thousands for an onsite risk assessment when you can take and manage it all online. There is nothing on the market that compares to this new tool. Our compliance expert, Rebecca Herold has taken her experience of more than 300 onsite risk assessments and consolidated them into a simple, understandable, yet fully complete assessment, all delivered through our industry leading, SIMBUS platform. SIMBUS uses its state-of-the-art management platform to deliver the assessment in an organized and highly efficient manner. 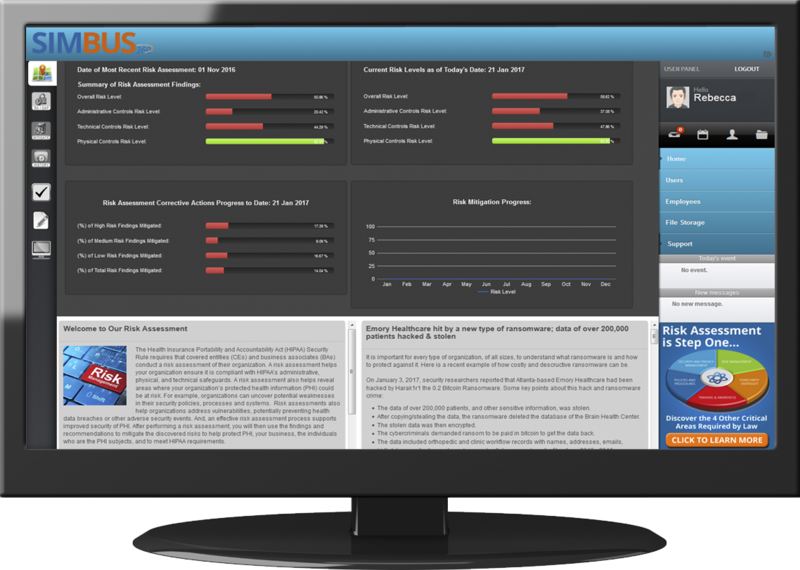 Each user receives a private dashboard where they can take the assessment as many times as needed throughout the year. We also have a version which allows for multiple assessments to be taken concurrently for separate locations. The dashboard is a fully web based, mobile responsive program designed to take the user to the next level of assessing risk. The dashboard is highly intuitive and there’s no software to install. Simply sign up and receive credentials and you can begin the assessment. Use the dashboard to add multiple admins, send notes, assign tasks and access 3rd party website like OCR or HHS. Risk Assessments can be overwhelming and although ours is highly condensed, there is still a lot of work involved. Many firms have multiple departments and several people managing compliance so we gave our users the power to add multiple user accounts. Each user is sent a welcome email created by the main admin and the user is invited to their own panel where they can complete their profile, add their photo and have their own notes. Log reporting is stored showing the users time on the site and which pages were accessed. Each user can answer all or part of the assessment and add notes and attach files on a question level. Once the assessment is complete, users can add information to each question or assign specific tasks to other users in the system. What good is a highly condensed Risk Assessment if you don’t know where the information originates. In SIMBUS RA, each question references exactly where the content came from. Whether its HIPAA, NIST, or ISO, it’s all there. Not only does it reference the source but when clicked, a popup window with the exact reference or standard is displayed describing the rule. Some questions reference more than 5 standards so it’s critical to have the source available. With a simple click of the mouse, users get access to the content without ever leaving the page. We built SIMBUS RA to be very efficient. Each question resides on its own page. We did this because we want users to be able to concentrate on each question and also have some tools available if needed. Each question comes with a few important features. First we give users the ability to add notes. Notes are critical, especially if there is collaboration between multiple users. We also have a file upload system where users can attach files. The files can be accessed in the report section of the assessment providing a highly efficient reference section on a question level. The third is our reference section where a user, with a click of the mouse, can see where the policy or law originated. This saves time and we know time is money! After the assessment is taken and the report is generated, we created a section after each question where the user can add more information including corrective actions, person/role assigned, target dates to mitigate, description of action taken and date completed. This information is saved within the system and can be viewed within SIMBUS RA or printed in PDF format. SIMBUS RA has a rock solid reporting feature which not only includes a highly sophisticated scoring method to generate multiple graphs for each section, it also delivers full findings and recommendation on an answer level. Depending how a question is answered, SIMBUS RA determines a score of High, Medium or Low Risk but based on the answer, delivers a finding, recommendation and reference of where the question originated. The report comes complete with company information, who took the assessment, departments/location who contributed, a full summary and scope of the assessment, Table of Contents and appendixes for quick reference. All reports are view-able online within SIMBUS RA or printable as a PDF report. The final report is fully printable using PDF format. The report comes with questions, answers, findings, recommendations, all notes, history, summary and company information. Graphs, and color coded risk levels are easily accessible through the PDF. We use Google Charts to generate colorful bar graphs and pie charts. The bar graphs show the overall risk level based on points for each section and the pie chart shows a percentage of risk level based on the number of questions in each section that were low, medium or high risk. There is also an overall risk level for the entire assessment that takes and average of all sections. Seeing a visual display of a company’s compliance level is always valuable. SIMBUS Multi-Location SRA allows companies to take multiple SRA's concurrently. With a simple select, users can load a specific assessment for a location and work on that location exclusive of the others. Each location will have its own report, findings and recommendations and mitigation tracking engine. SIMBUS RA is a cloud based solution and can be purchased through our website. There's no need to speak to anyone to establish an account. Unlike our competitors, SIMBUS RA is accessible immediately upon successful checkout. We're all about automation and there’s no need to delay compliance. Simply checkout, setup your username and password and get instant access to your private dashboard. That is of course you are ready to begin the assessment. If not that’s OK. We love giving demos. If you are not 100% satisfied with SIMBUS RA then let us know within 30 days through support or give us a call us we’ll be happy to refund 100% of your money. There’s absolutely no risk. Note: If the assessment has been fully completed in the first 30 days, refunds will not be granted unless special circumstances exist. Please use our automated scheduler and pick a day and time.